I love za’atar – I put it with absolutely anything: in omelettes, on chicken, on figs(!). Really, really yummy. 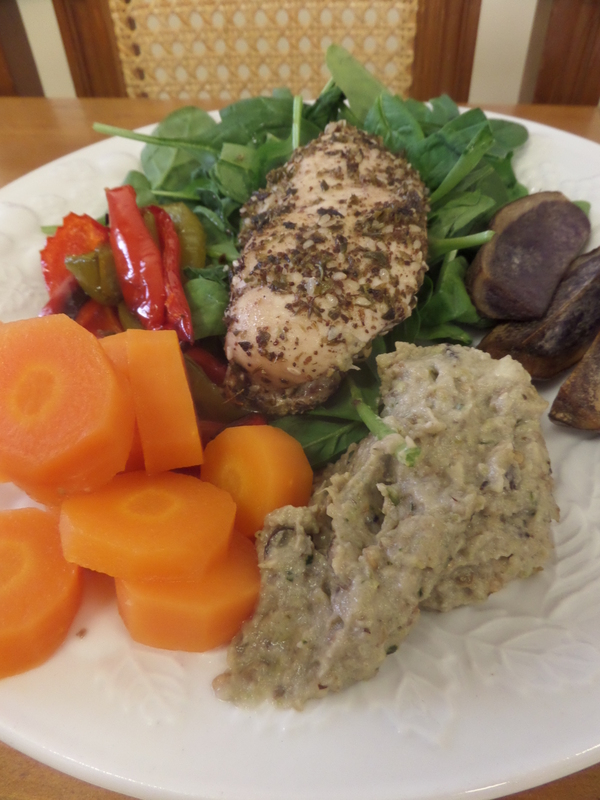 So, yes, today it was on baked chicken, which we had with purple potatoes (YUM – may be a new favourite potato development! ), baba ghanoush, char-grilled peppers, and…spinach and carrots. How…fitting? Not. Yeah…doesn’t look that appetizing here, but it really was! And purple potatoes are really gorgeous…they also make great wedges! Anyway, it’s really easy to make your own za’atar mix – I used equal amounts of oregano, marjoram, sesame seeds, sumac and thyme. Play around with the proportions, and add a little salt if you wish until it suits your tastes. Posted in chickenTagged chicken, za'atarBookmark the permalink.